Wondering if you’re going through a quarter life crisis? 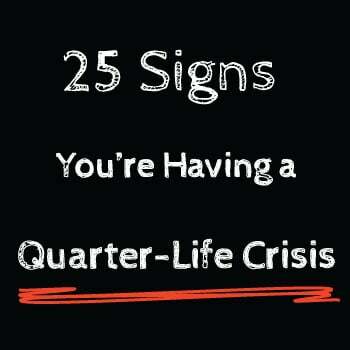 Check out this hilarious and all-too-true list below to see just how “quarter life crisis” your life crisis really is. 2. “Am I ever going to feel like myself again?” Is something you ask. Every day. 3. A Bon Iver or John Mayer song comes on and you start crying. By yourself, or around friends. Or in the middle of a coffeeshop as strangers slowly usher their children away. 4. “When is life going to feel like it’s supposed to?” Is something you ask. Every day. 6. Visualizing yourself 15 years from now doing your boss’s job makes you throw up a little in your mouth. 8. 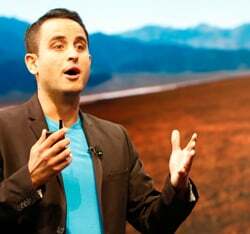 Your monthly routine of expenses being greater than your income is dawning on you as a serious problem. 10. You’ve moved six times in the last four years. B. You’ve had six jobs in the last four years. C. You’ve had six boyfriends in the last four years. D. You’ve had six girlfriends in the last four years. E. You’ve had no boyfriends/girlfriends in the last six years and you’re scared your boyfriending or girlfriending is broken. 11. You’d pay top dollar for a moment of clarity. 12. 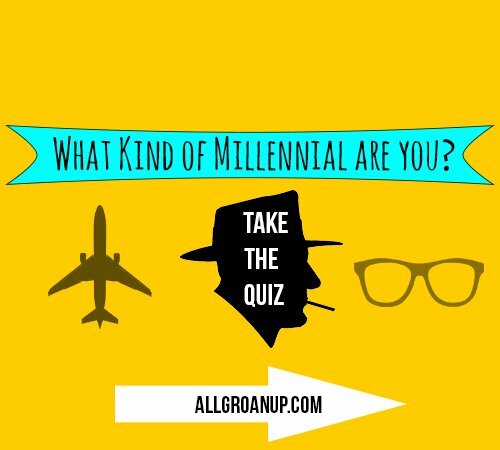 You feel like you’re being crushed by either anxiety, unemployment, or just crazy amounts of college debt — you know, like most Millennials these days. 13. Your part-time, temporary job at Starbucks has lasted three five and ½ years. 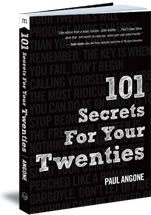 Find help for your quarter life crisis with Paul Angone’s best-selling book 101 Secrets For Your Twenties. Over 217, 5-Star reviews and counting on Amazon. 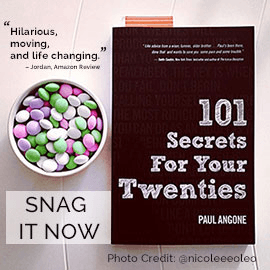 Check out what people are saying about 101 Secrets For Your Twenties. 14. You binge on buying brand names to try and cover up that you’re broke. 15. You find yourself repelled and compelled by church at the same time. You ask God for help one day and then you’re yelling at him the next. Your faith is a roller coaster and you’re pretty sure your seat belt is about to come undone. 16. You see so clearly the two roads in front of you. A life of comfort and a life of risk. And you’re not sure you have the right car or directions to go down either one. 17. You surf the internet so much at work every day that you literally hit a point where you don’t know what else to search for. 18. You laughed, and cried, when you first read 21 Secrets for your 20s. 19. Making a budget is completely debilitating. Even thinking about doing your taxes. Debilitating. Doing dishes. Cooking dinner. Looking for a job. Calling your mom back. Calling your best friend back. Picking up the phone at all. DEBILI-FRICKING-TATING. So you watch four seasons in a row of _________, while Facebook stalking exes and enemies. 20. The phrase you dread hearing the most at work is, “Congratulations, you’re getting a promotion” because you’re getting pushed deeper into a job you despise. 21. You dream about going back and punching your Smug-College-Self who was so sure had all the answers. 22. You feel like every time you’re a bridesmaid or groomsman, an angel loses it’s wings. 23. You seek out a mentor for answers one week and you avoid them like the 8th grader with bad BO, the next. 24. You have no idea where to go for answers. Or even, how to find the right questions. 25. You’re 99.7% sure a road trip would fix everything. 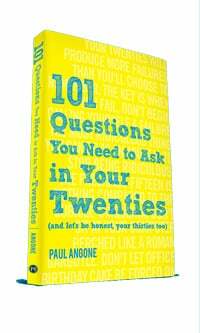 Help cure your quarter life crisis with my new book 101 Questions You Need to Ask in Your Twenties. 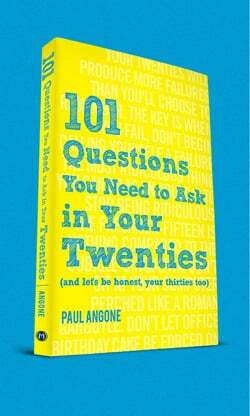 Snag 101 Questions You Need to Ask in Your Twenties here.